But it will be the biggest one yet. 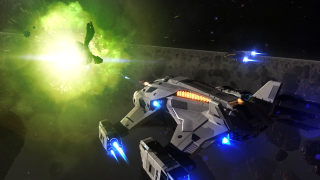 Elite Dangerous' next major update will be the biggest one yet, promises developer Frontier, ushering in a new era for the space sim. Unfortunately, the size and scope means that it won't be appearing until the second half of 2020. The good news is that lots of smaller updates will keep the galaxy spinning in the meantime. With Beyond, Elite got a whole year of large free updates, so we've been a bit spoiled lately. The next big 'un will be a paid expansion, however, while lifetime expansion pass owners will get it automatically when it arrives next year. Frontier isn't ready to announce the contents of the expansion, though it has teased the free updates coming to the game across the year. It wants to make the galaxy a more lively place, with new events and activities, as well as making changes to how these events happen. The frequency of community goals is also being tweaked, and they'll now support events, along with reputation boosts, new assets, global galactic changes and a bunch of other things that the developer hopes will make the Milky Way a more engaging galaxy. The changes to events will be starting in the coming months, and Frontier's also planning a series of updates releasing every three to four months, kicking things off by reworking the new player experience and adding quality of life improvements that will affect everyone. The developer wants to make the game more welcoming, while also encouraging old players to return. Like the events, it's all very focused on community, which seems like a pretty sensible way to keep the game active between now and the next expansion. Expect more news about the first update soon.